Seats: Seating for approximately 100, with lounge style accomodations available in the rear area of the sports book. Screens: 100 screens, including 11 jumbo-sized HD screens. 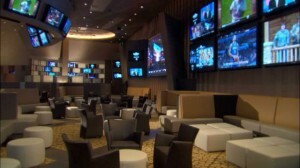 The well-appointed Aria Sports Book follows the newer trend of lounge-style seating while being one of the more swanky sports betting havens on the Las Vegas Strip. There are different sections of seating areas within this sports book, which is tucked away in a corner of the casino area adjacent to the SkyBox Bar and Grill. The betting counters are well-staffed so getting action on a game or a horse race is a breeze. Drink tickets are offered for horse players betting $20 or more and you will have to lay the lumber on sports bets in order to score drink tickets, which can be redeemed at the aforementioned SkyBox Bar. The cocktail service here can fall short at times. On a recent weekend afternoon, I sat in the horse racing area for approximately 20 minutes until I was approached by a female Aria Staff Member and was offered……a massage! For a fee of course. Needless to say, I declined the massage and indicated that I would prefer to redeem my drink ticket, but alas, no luck. 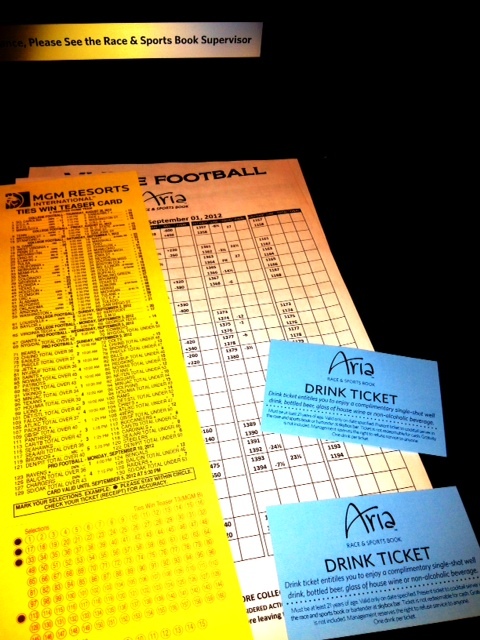 Aria is a beautiful property and the sportsbook, with its upscale and modern feel, is equally as impressive. If you are looking for a different type of set up from the typical Vegas sports book, Aria will certainly fit the bill. But plan ahead and get here early on busy sports betting days in order to take advantage of the plush seating that gets gobbled up quickly. Odds and Ends: Five50 Pizza is located directly adjacent to the sports book. Gormet pizza and a wide selection of craft beers can be found here – just expect to pay a little more than your typical Vegas pizza spot. Follow The Vegas Parlay – The Las Vegas Sports Book Blog on Twitter and “Like” us on Facebook!